Attention all Scout leaders! 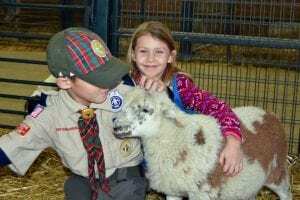 Green Meadows Farm is hosting another Scout Day at the farm in the spring. Come visit our 123-acre farm in Ijamsville, Maryland for a unique Scouting experience and the opportunity to complete Cub Scout Adventures and Girl Scout Journeys. In addition to offering advancement opportunities, Green Meadows Farm is the ideal place for a fun field trip for your unit and your family! Green Meadows Farm features over three hundred animals you can get up close and personal with including: goats, sheep, pigs, cows, horses, poultry, rabbits, our kangaroo, Bindi and more! Feed is included with every admission. Scouts will love going on a scenic wagon ride and heading out on our half-mile hiking trail through farm fields, wood and streams. We offer pig races and cow-milking (and yes, it’s real!) throughout the day. Picnic lunches are welcome; bring a blanket and enjoy the warm spring weather on the farm. This is an event you won’t want to miss! Remember the best part of memories is making them! Green Meadows Farm is happy to offer Scout leaders a free admission with every 10 paid admissions. (Pre-registration is required to qualify for this offer.) All payments may be made at the gate on the day of event. (Credit cards are accepted with an additional surcharge.) To register your Scouting unit today, please fill out the form below. All fields must be completed and registration received by April 3, 2019. Your email will only be used to update you on other Scouting activities and discounts at Green Meadows Farm. To stay updated on the latest & greatest, like us on Facebook! Have questions? Contact us at Ashlee.gmf@gmail.com or call 301-865-9203. See below to register.